As you all know, SWAT 3 is a simulation. A simulation, by definition, simulates some real world situation or scenario. Thus, when you are playing SWAT3, you are in essence, practising for the real thing. 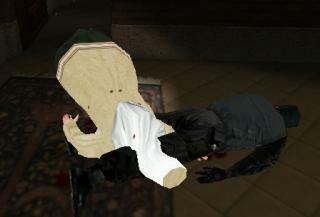 Therefore, the game designers attempted to make SWAT3 as realistic as possible. That being said, it is often not very realistic. In the real world, you would not be confined to certain body movements as your character in the game is confined. You would have many more options for executing the scenarios, such as: use of your hands, use of a baton or OC spray for up close contact with resistant subjects, the ability to call for a sniper shot, the ability to do things in real time instead of lag time, etc. This does not mean that the simulation is not at all realistic. Overall, it is as realistic as the technology allows it to be. Therefore, we must work within the confines of the simulation to achieve the desired result, the successful completion of each mission. It is to that end that this guide is really written. The tactics that follow are used every day by SWAT teams all over the United States and other countries. While there may be many variation on the basic tactics, they are all sound and should translate well to the simulation. There's nothing complicated about the objectives. Successfully complete the mission and you win. How do you successfully complete the mission? Well, you must check the briefing before or during each scenario. It will often list the objectives, such as: Locate and Secure "Subject X," Arrest "Joe Blow," Bring Order to Chaos, Secure All Weapons etc. If you fail to meet any of the listed objectives, you fail the mission. One important objective is the rescue of civilian hostages. In many levels, the success of the mission depends on you bringing them out alive. A good example is the "The Church." In that level, you must rescue all the clergy to succeed. In the screenshot to the right, you see a dead clergy member along with a dead terrorist. The terrorist basically used this hostage as a human shield and the AI officers killed both. The fact that the terrorist used the hostage as a human shield is very realistic. The fact that you fail for not bringing the clergy out alive is also realistic. As the game features realistic goals and scenarios, it is useful to employ realistic terminology. Here are some important definitions that may aid you in playing multiplayer co-operative games and/or understanding real world SWAT tactics. Baton: A wood or metal stick used to strike non-compliant subjects in order to gain compliance with verbal commands. Batons are often expandable, ranging in extended length from 16 to 31 inches, and are usually made of either forged steel or aluminum. Breach: To open a door using a C2 charge or shotgun breaching round. Used in dynamic mode to facilitate a fast entry. Compromise: Called by any team member to alert the rest of the team that there is a threat. Sometimes used during fast dynamic play to alert that the C2 charge is about to be detonated. Entry Point: The location at which the team elects to enter the structure, preferably an area with minimal suspect observation. Fatal Funnel: The area directly in front of a door or window that exposes the team member to fire from within the room or structure. You should always minimise the amount of time you spend in the Fatal Funnel. Field of Fire: The area that one team member is exclusively responsible for covering, usually referred to as on a clock face. For example, covering from 4 o'clock to 8 o'clock would be the responsibility of the person covering behind the team. IED: An "improvised explosive device." These range from booby traps, pipe bombs and other small-scale homemade explosives to the larger bombs like the truck bombs used in the Oklahoma City and the World Trade Center bombings. Stack: The line of team members that will enter a structure or room upon command from the EL. This is discussed in detail in another section.